Ferrari has rolled out an all-new version of the 458 Speciale; this new version has all the speed of the original coupe in a drop top variant. Ferrari uses no plain soft top on the Speciale A, this car uses a retractable hard top that can be raised or lowered in 14 seconds. In addition to a speedy hard top, the car is festooned with aerodynamic tidbits. The A in the name stands for Aperta, and the car is the most powerful spider in Ferrari history. Only 499 of these special convertible cars will be built. Despite being a convertible, the car will be very fast and can hit 100 km/h in 3 seconds. It also uses ten different aluminum alloys in its construction to keep weight down. Ferrari equips the car with a special slip-Angle Control system to allow drivers to get all the performance available from the car on corner exits. 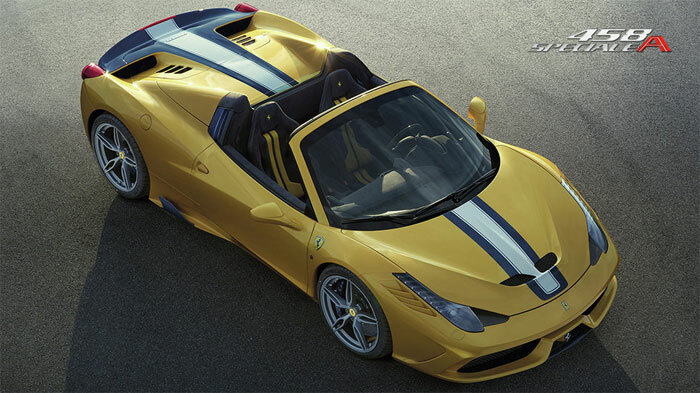 The first of the 458 Speciale A cars is covered in Modena Yellow with a central stripe in Blu NART and Bianco Avus. The color combination is homage to an American endurance racing team from the 60s. Inside the car has lots of carbon fiber trim, pricing and availability are unknown.